History was created at the Imani Pre-School last Thursday, May 25. 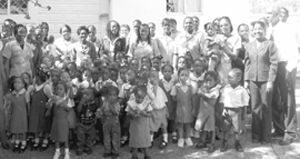 The school was the first ever in St. Vincent and the Grenadines to join a cooperative. The intiative was the brainchild of Sheryl Moore, President of the Parent Teacher Association. Moore said that the whole idea of the cooperative came out of a meeting with staff and parents, and though it was quite difficult in the initial stages to get the cooperative off the ground, she urged other pre-schools to get involved in the cooperative movement. Manager of GECCU, Lennox Bowman (at right in photo) said that he was quite glad with the step taken by the pre-school. He also strongly encouraged parents to enroll their children in the cooperative. Bowman thanked the cooperative department for the role they played in the establishment of the cooperative at the school. Imani opened its doors on September 7, 1998 and has a population of 70 students.